Todd Helton reflects on Rocktober - Denverite, the Denver site! It’s been 10 years since the 2007 Rockies ripped off 21 wins in 22 games to get into the playoffs and go all the way to the World Series. Sep. 15, 2017, 7:30 p.m. The man who sports one of baseball’s G.O.A.T. goatees was back in Denver on Friday. Todd Helton, widely considered the best player in Rockies franchise history, returned to the Mile High City along with most of his teammates from the 2007 season to remember Rocktober. It’s been 10 years since the 2007 Rockies ripped off 21 wins in 22 games to get into the playoffs and go all the way to the World Series. To celebrate, 18 members of that team were honored in a pre-game ceremony at Coors Field before the Rockies took on the Padres. Helton, who retired in 2013 after 17 seasons as a Rockie, took some time to reflect on that magical run. Helton, Jeff Francis, Brad Hawpe and others stood on the field and soaked in highlights on the big board in left. The reunion gave Helton a chance to catch up with some of his old teammates, including Josh Fogg, the journeyman righty who earned the nickname “Dragon Slayer” after repeatedly out-dueling other team’s aces during that run. 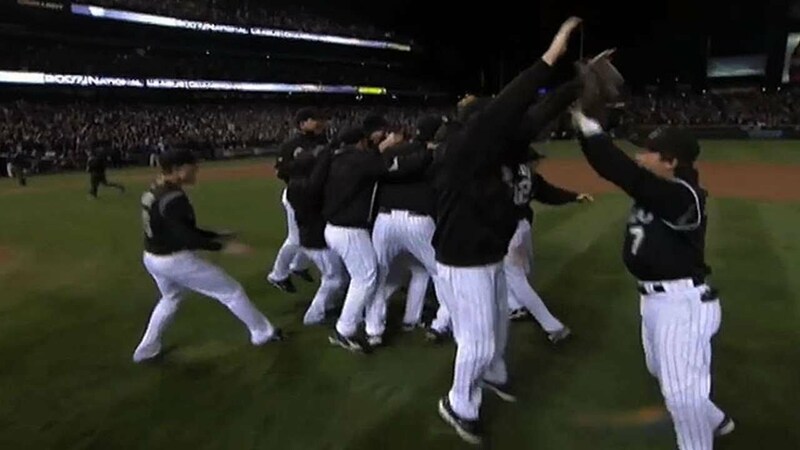 The Rockies famously defeated the San Diego Padres 9-8 in 13 innings in the one-game playoff. Rockies skipper Bud Black managed the Padres back then. Black likened Colorado’s red-hot run into the playoffs to a moment from a 1969 Western movie. Rocktober culminated in a four-game sweep of the Arizona Diamondbacks in the NLCS. The enduring image of the series was Helton squatting down and raising his hands to the sky after helping record the final out.